Upon inhaling enough carbohydrates to hibernate for the winter this Thanksgiving, it's likely you felt a little something like a beached whale. This is not, however, a nice thing to say out loud, as it may be offensive to actual beached whales -- like, say, the fleet of approximately 145 marine mammals discovered on a sandbank along New Zealand's South Coast over the weekend weekend. 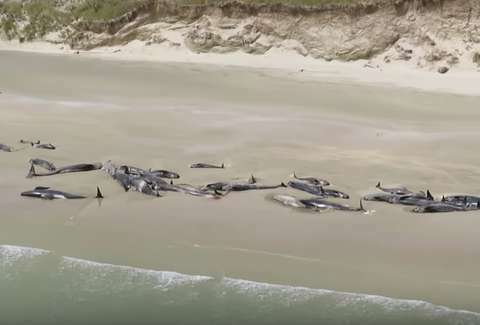 On Saturday night, a group of campers, presumably minding their own business, stumbled onto the beach at Stewart Island's Mason Bay, only to find that it was already occupied... by a small army of stranded whales. Promptly, the travelers hiked to a local field base where they could contact the New Zealand Department of Conservation, and report the tribe of whales they'd just witnessed trapped ashore, according to a report by CNN. In a statement released Monday, by the department's Rakiura Operations Manager Ren Leppens claims that nearly half the whales were already dead once his team had arrived. "Sadly, the likelihood of being able to successfully re-float the remaining whales was extremely low," he said. "However, it's always a heartbreaking decision to make". Unfortunately, due to the beach's "remote, difficult to access location." Leppens and his team had no choice but to euthanize the remaining living whales. Strangely enough, on Sunday, in an unrelated incident elsewhere in New Zealand, 10 pygmy killer whales were discovered, similarly stranded on Ninety Mile Beach on the country's North Island. Scientists are still attempting to "re-float" a number of them, but there are no guarantees. As you may have guessed, beached whales are not exactly a shocking phenomenon on New Zealand shores. When they arrive in the hundreds, however, it's a different story. "Exactly why whales and dolphins strand is not fully known," Leppens explained, "but factors can include sickness, navigational error, geographical features, a rapidly falling tide, being chased by a predator, or extreme weather." Perhaps for these whales, it was a question of solidarity. Or maybe they simply got some bad directions. Either way, the deaths of these majestic animals is a terrible loss.